We are pleased to announce a gorgeous litter of 8 adorable, sweet, Mini Goldendoodles born on December 15th. Based on their 48 pound Goldendoodle mom (Libby) and their 14 pound Mini Poodle Dad (Big Red), we expect this litter of puppies to be approximately 20-33 lbs. These beautiful little pups have the sweetest personalities to match their stunning looks. They have been so much fun to raise, and although they will be hard to say goodbye to, we are sure the joy they brought us will be shared with some very fortunate forever homes! For pups that are hand delivered outside the state of SC, for the $345 flat fee, there will be no sales tax. Our first pup in this litter is Rosemary a very pretty Mini GoldenDoodle with a soft wavy coat you will want to snuggle with for hours! She loves to have fun with with her siblings, and she is gentle, loyal, and compassionate. She is a great pup, and we think that she will be a wonderful companion. Rylie is an adorable little cutie with a wonderful personality! She is a gorgeous little girl with a soft Apricot coat. She is loving, playful and great around kids. She loves to snuggle up to us at nights, and we will miss her! Raegan is a happy and fun-loving sweet little girl. She has a gorgeous, curly cream coat that she loves to have petted. Her tail has a big, wide wag, and she likes to follow us around the yard. We think that Raegan will receive lots of compliments for her gorgeous coat and friendly personality! 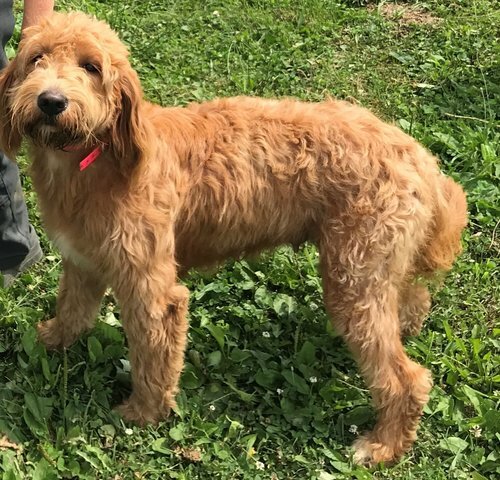 Rayna is a pretty Mini GoldenDoodle with a huge heart for people. She loves company and especially loves being held and petted. We love her beautiful red coat - she is a great looking pup and we know that he will make a wonderful companion. Rachelle, like her sister Rayna, also has a beautiful red coat. Her loving eyes will steal your heart the moment you meet her! She is fun-loving and can regularly be found romping around with her siblings. Rachelle is super loving and very loyal, and we think that she will be wonderful for an any family or individual. Ryder is a gorgeous Mini-GoldenDoodle with the kind of face you just can't say no to. He is so much fun to be around and always finds a way to make us smile! He has a super soft wavy apricot coat that you will fall in love with as you snuggle with him! Ryder is super smart and loving, and we know that he will be a wonderful furry family member. Rigby is a sweetheart of a puppy with a gorgeous wavy, Apricot coat. He loves having fun with his siblings, and is so very kind and affectionate to everyone he meets. Rigby embodies the best characteristics of Goldendoodles and will make a wonderful furry companion! Ramsey is a super cute Mini-Goldendoodle with the softest beautiful apricot coat you can imagine. He loves to play with his siblings and enjoys a good adventure. He is very smart and loyal, and loves to be held. He will be one of the hardest to have to say goodbye to, but we are excited to know what a great companion he will be for a very lucky family!